The Virgin and Child or The Madonna of the Book by Sandro Botticelli, 1480. 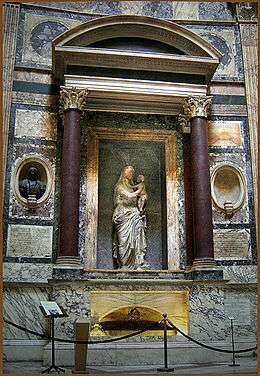 A Madonna (Italian: [maˈdɔnna]) is a representation of Mary, either alone or with her child Jesus. 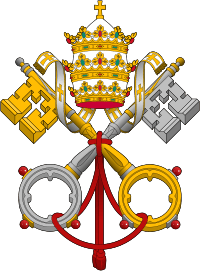 These images are central icons for both the Catholic and Orthodox churches. The word is from Italian ma donna, meaning "my lady". 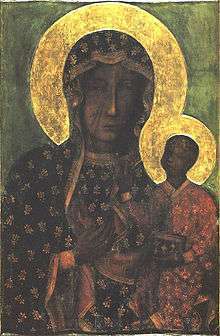 The Madonna and Child type is very prevalent in Christian iconography, divided into many traditional subtypes especially in Eastern Orthodox iconography, often known after the location of a notable icon of the type, such as the Theotokos of Vladimir, Agiosoritissa, Blachernitissa, etc., or decriptive of the depicted posture, as in Hodegetria, Eleusa, etc. 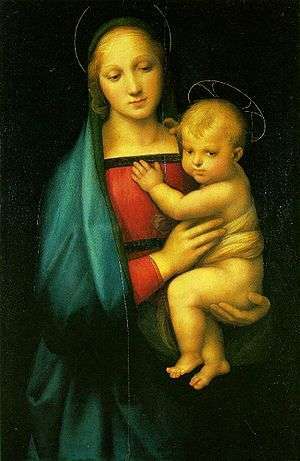 The term Madonna in the sense of "picture or statue of the Virgin Mary" enters English usage in the 17th century, primarily in reference to works of the Italian Renaissance. In an Eastern Orthodox context, such images are typically known as Theotokos. "Madonna" may be generally used of representations of Mary, with or without the infant Jesus, is the focus and central figure of the image, possibly flanked or surrounded by angels or saints. 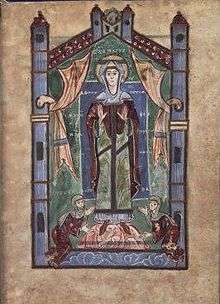 Other types of Marian imagery have a narrative context, depecting scenes from the Life of the Virgin, e.g. the Annunciation to Mary, are not typically called "Madonna". 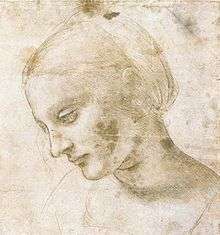 The earliest depictions of Mary date still to Early Christianity (2nd to 3rd centuries), found in the Catacombs of Rome. These are in a narrative context. The classical "Madonna" or "Theotokos" imagery develops from the 5th century, as Marian devotion rose to great importance after the Council of Ephesus formally affirmed her status as "Mother of God or Theotokos ("God-bearer") in 431. 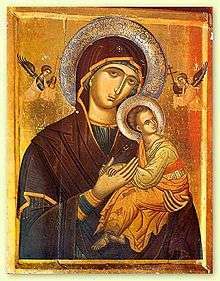 The Theotokos iconography as it developed in the 6th to 8th century rose to great importance in the high medieval period (12th to 14th centuries) both in the Eastern Orthodox and in the Latin spheres. 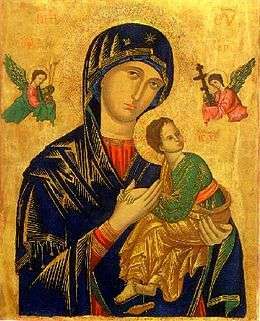 According to a tradition recorded in the 8th century, Marian iconography goes back to a portrait drawn from life by Luke the Evangelist, with a number of icons (such as the Panagia Portaitissa) claimed to either represent this original icon or to be a direct copy of it. 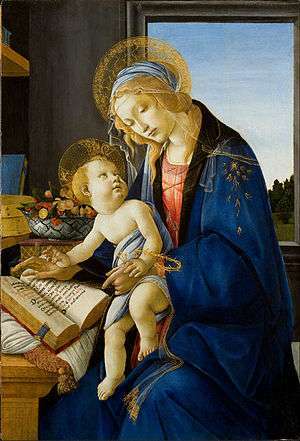 In the Western tradition, depictions of the Madonna were greatly diversified by Renaissance masters such as Duccio, Leonardo da Vinci, Michelangelo, Raphael, Giovanni Bellini, Caravaggio and Rubens (and further by certain modernists, such as Salvador Dalí and Henry Moore) while Eastern Orthodox iconography adheres more closely to the inherited traditional types. 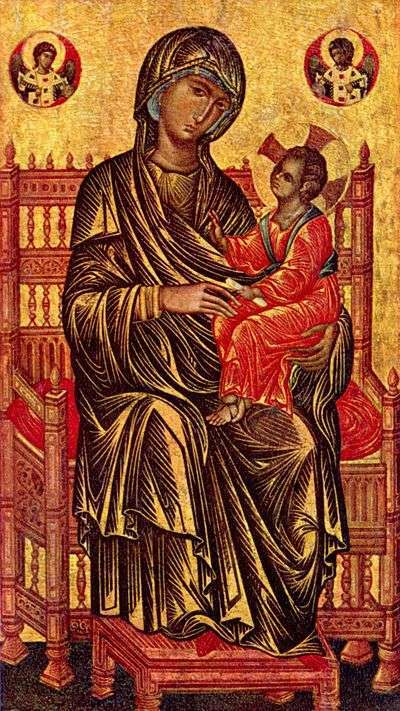 The Madonna enthroned is a type of image that dates from the Byzantine period and was used widely in Medieval and Renaissance times. These representations of the Madonna and Child often take the form of large altarpieces. They also occur as frescoes and apsidal mosaics. 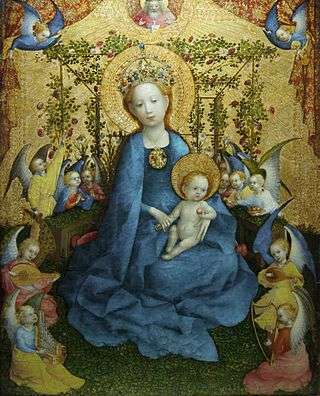 In Medieval examples the Madonna is often accompanied by angels who support the throne, or by rows of saints. 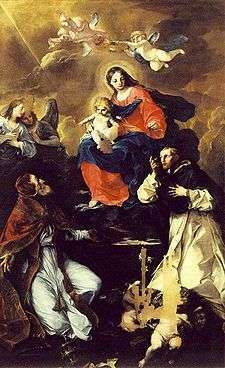 In Renaissance painting, particularly High Renaissance painting, the saints may be grouped informally in a type of composition known as a Sacra conversazione. 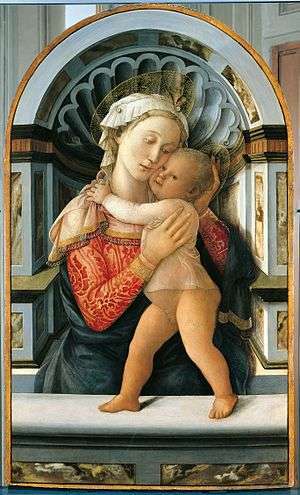 The seated Madonna and Child is a style of image that became particularly popular during the 15th century in Florence and was imitated elsewhere. These representations are usually of a small size suitable for a small altar or domestic use. They usually show Mary holding the infant Jesus in an informal and maternal manner. These paintings often include symbolic reference to the Passion of Christ. 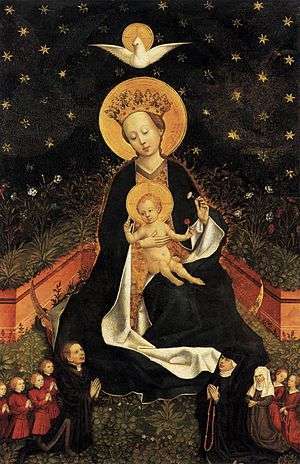 The Adoring Madonna is a type popular during the Renaissance. These images, usually small and intended for personal devotion, show Mary kneeling in adoration of the Christ Child. Many such images were produced in glazed terracotta as well as paint. 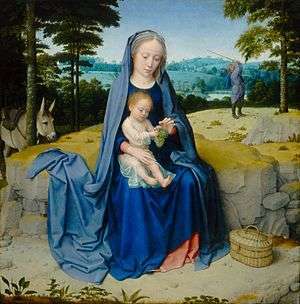 The Rest on The Flight into Egypt, c. 1510, by Gerard David depicts a close, intimate moment of tenderness where she only has eyes for the Child. This is the case of one of the most famous, innovative and monumental works that Duccio executed for the Laudesi at Santa Maria Novella in Florence. Often the scale of the work indicates a great deal about its original function. Often referred to as the Rucellia Madonna (c. 1285), the panel painting towers over the spectator, offering a visual focus for members of the Laudesi confraternity to gather before it as they sang praises to the image. 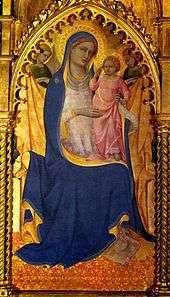 Duccio made an even grander image of the Madonna enthroned for the high altar of the cathedral of Siena, his home town. Known as the Maesta (1308–11), the image represents the pair as the center of a densely populated court in the central part of a complexly carpentered work that lifts the court upon a predella (pedestal of altarpiece) of narrative scenes and standing figures of prophets and saints. 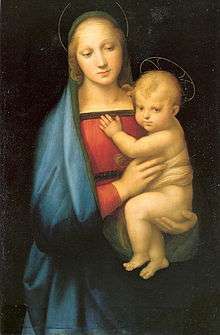 In turn, a modestly scaled image of the Madonna as a half-length figure holding her son in a memorably intimate depiction, is to be found in the National Gallery of London. 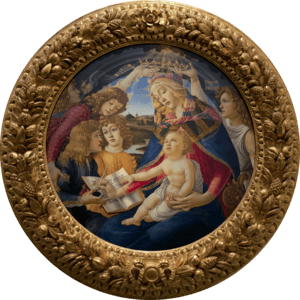 This is clearly made for the private devotion of a Christian wealthy enough to hire one of the most important Italian artists of his day. While the focus of this entry currently stresses the depiction of the Madonna in panel painting, it should be noted that her image also appears in mural decoration, whether mosaics or fresco painting on the exteriors and interior of sacred buildings. She is found high above the apse, or east end of the church where the liturgy is celebrated in the West. She is also found in sculpted form, whether small ivories for private devotion, or large sculptural reliefs and free-standing sculpture. As a participant in sacred drama, her image inspires one of the most important fresco cycles in all of Italian painting: Giotto's narrative cycle in the Arena Chapel, next to the Scrovegni family's palace in Padua. This program dates to the first decade of the 14th century. In Germany such a statue placed on the outside of a building is called a Hausmadonna. Some date back to the Middle Ages, while some are still being made today. Usually found on the level of the second floor or higher, and often on the corner of a house, such sculptures were found in great numbers in many cities; Mainz, for instance, was supposed to have had more than 200 of them before World War II. 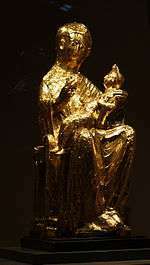 The variety in such statues is as great as in other Madonna images; one finds Madonnas holding grapes (in reference to the Song of Songs 1:14, translated as "My lover is to me a cluster of henna blossoms" in the NIV), "immaculate" Madonnas in pure, perfect white without child or accessories, and Madonnas with roses symbolizing her life determined by the mysteries of faith. In Italy the roadside Madonna is a common sight both on the side of buildings and along roads in small enclosures. These are expected to bring spiritual relief to people who pass them. Some Madonnas statues are placed around Italian towns and villages as a matter of protection, or as a commemoration of a reported miracle. ↑ Doniger, Wendy, Merriam-Webster's encyclopedia of world religions, 1999, ISBN 0-87779-044-2 page 696. ↑ Johannes Schneider, Virgo Ecclesia Facta, 2004, p. 74. Michael O'Carroll, Theotokos: A Theological Encyclopedia of the Blessed Virgin Mary, 2000, p. 127. ↑ Anne-Madeleine Plum, "Kreuzzepter-Madonna--Zypertraube und fruchtbringende Rede" and "Maria, Geheimnisvolle Rose", in Wöhrlin, Mainzer Hausmadonnen, 49-54 and 55-57. 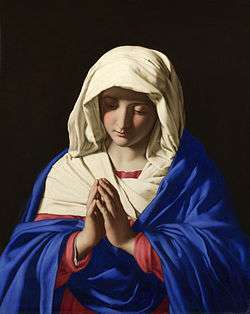 Wikimedia Commons has media related to Depictions of the Virgin Mary.